Blakeford is a not-for-profit corporation providing you with wonderful senior living options in multiple levels of service: Independent Living, Assisted Living,Skilled Nursing or Intermediate Care Nursing. As your needs change, you have the security in knowing that you will receive uncompromising service at our unparalleled location. Nestled on 10 acres surrounding Lake Burton, Blakefordâ€™s park-like campus gives residents access to walking trails, peaceful fountains and lush landscaping, encouraging a lively, active community. Independent Living apartment homes feature fully equipped and updated kitchens, private balconies or patios, convenient parking and seven, customizable, one and two-bedroom floor plans. Independent Living at Blakeford offers access to the full spectrum of Blakeford's health and lifestyle accommodations. Independent Living residents enjoy: Main Dining Room with private dining available with reservations, The Bistro at The Blakeford which offers a more casual style of dining and full bar service in the evenings, Multi-Purpose Activity Room, Living Room with beautiful view of Lake Burton, Library and Business Center, Card and Game Rooms, Arts and Crafts Room, Beauty Salon and Barber Shop on site, Wellness Center, Beautifully landscaped Courtyard and Greenhouse. Your monthly service fee includes: Dining Dollars to be used in our beautiful dining room and Bistro, weekly housekeeping with linen service, all utilities (except telephone) emergency call and response system, wireless internet, transportation service, cultural, educational and social events, along with full access to the wonderful public areas of our campus. 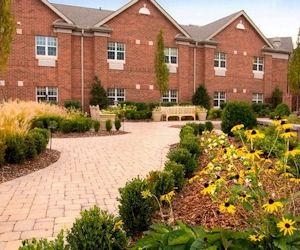 Our licensed Assisted Living apartment suites accommodate a supportive lifestyle, while residents enjoy Blakeford's lovely campus, stylish dining and all the activities, events, and services at Blakeford. Providing a wide range of health care services, our licensed, Medicare-certified Woodcrest Health Center, is a reassuring, comforting environment for residents who experience an acute medical incident, or who need continuing care. Our Green Hills location offers shopping and restaurants, and our residents stay involved in the Nashville community through easy access to cultural events, museums, places of worship, university activities, sports arenas, and social clubs. Also just minutes from all major medical centers, Blakefordâ€™s central location enables our residents to maintain existing relationships with healthcare providers and leisure time pursuits, contributing to a sense of well-being, independence, and peace of mind.